One of the most famous stories of Rome, the history of Romulus and Remus continues to captivate to this day. The history of Romulus and Remus tells the story of how Rome was first founded, and modern archaeology provides tantalizing clues to the legend of these brothers as well. The story begins in the city of Alba Longa. The Romulus and Remus legend contends that they were the twin grandsons of Numitor, rightful king of the land. The twins appear to be divinely conceived, with a human priestess mother and the god Mars. The history of Romulus and Remus begins with strife, when Numitor’s brother Amulius disposed of him and left the twins to die in the Tiber River as infants. The fates were on the side of the twins, and they survived due to one miracle after another. Instead of drowning, a she-wolf discovered the twins and nursed them as infants, along with the help of a woodpecker that would bring the babes food. Then, they came under the care of a kindly shepherd and his wife, who raised them to adulthood. By another incredible twist of fate, they ultimately ended up being brought face to face with Amulius and were told of their real identities. As natural leaders, the brothers were able to amass a strong following and dispose of Amulius, restoring their grandfather, Numitor to the throne. With their grandfather at his rightful place on the throne, the brothers then decided to found a city of their own. When faced with the task of locating the site of their city, the brothers were conflicted. Romulus was in favor of building their city on Palatine Hill, but Remus favored Aventine Hill. They decided it would be up to the gods to decide the location of the city and began to look for divine signs. According to the history of Romulus and Remus, each brother saw signs in the form of birds. While Romulus saw more birds than Remus, Remus contended that he saw his first and therefore was in the right. Eventually, work began on the site that Romulus selected, while disputes between the brothers continued to grow. Eventually, these disputes led to brother turning on brother. According to the Romulus and Remus legend, Romulus murdered Remus after his brother mocked a wall that he had built on the site. The city was then named Roma after Romulus and he went on to create the Roman Senate and Roman legions. 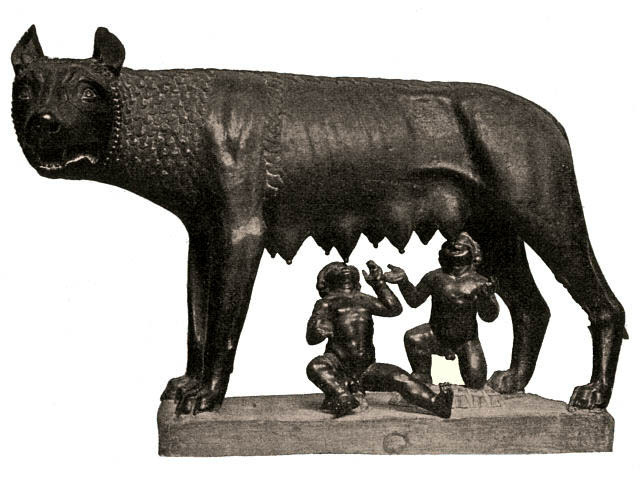 Archaeologists and scholars often see the Romulus and Remus legend as an analogy for Roman citizens and the history of the city itself. Although there is little doubt that the city itself garnered its name from Romulus, there is great speculation about his brother Remus and the circumstances of his death. In addition, there is great speculation about whether or not the brothers actually did exist. Scholars commonly accept that the brothers were a myth themselves, and that the city gained its name from the fictional character of Romulus, and the evidence presented by archaeology lends credence to this belief. For modern visitors, Rome offers up tantalizing archaeology, which hints at the history of Romulus and Remus. Symbolism showing a she-wolf with two infant children abounds throughout Rome. Pliny the Elder even described a statue of the she-wolf that once stood in the Roman Forum. A bronze statue that closely represents the original is on display in the Capitol Museum. Although this statue has been dated to the middle ages and not the antiquities, it is still fascinating to gaze upon a modern reminder of Romulus and Remus legend. Another recent find in Roman archaeology is commonly recognized as a memorial to the Romulus and Remus legend. Located under Palatine Hill, the site discovered in 2005 has yielded rich finds pointing to the location serving as a memorial dedicated to the brothers during the Roman age. Among the artifacts found were painted seashells, pumice stones and even mosaics. Archaeologists working on a renovation project centered on Emperor Augustus’ palace discovered the cave, which has been closely tied to the Romulus and Remus legend. Other finds in Modern archaeology have heralded other tantalizing glimpses that support the Romulus and Remus legend as well. In 1988, a wall dating back to the appropriate period was unearthed, fitting nicely into the history of Romulus and Remus. At least one modern archaeologist has even gone so far as to claim it is the very wall depicted in the history of Romulus and Remus. The history of the city of Rome is closely entwined with the history of Rolumus and Remus. The story of the rise of Rome seems to echo the themes found in the history of Rolumus and Remus, and modern archaeology has found clues that ancient Romans embraced these brothers as their city founders, regardless of fact or fiction. In addition to these finds by modern archaeology, the theme of Rolumus and Remus has appeared in many different forms of Roman art. From mosaics to coins, the imagery of twin boys being nursed by a wolf has appeared in a vast array of mediums. The history of Romulus and Remus may be only a legend, but it has been woven into the deep fabric of Roman history and provides an interesting tale to demonstrate the origin of this majestic city.